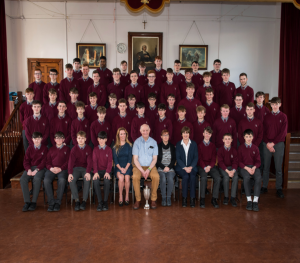 De La Salle College, Senior Choir won on the double at this year’s Navan Choral Festival, coming first in two of the festival’s three competitions for secondary school choirs. They didn’t enter the third competition! Three choirs competed in the Irish Song competition. De La Salle came first with a mark of 88. Later in the day, the Waterford choir performed in the main competition which had 17 entries. De La Salle out-performed some of Ireland’s top second-level schools such as Wesley College, Alexandra College, Ursuline Thurles and Maynooth Combined Community Colleges, coming first in the competition. They are now the 2018 Navan School Choir of the Year. This is not their first success this year. In April, at the Cork International Choral Festival, they won the prestigious Irish Federation of Musicians Associated Professions Trophy for the best performance of a song in Irish by any school choir competing in this year’s festival. Congratulations to the boys and their mentors. This is a great achievement.